Hit a Good One and the Damage is Done! When we think of damage to our cars, we usually think of the obvious. Damage from hitting a parked car or from accidentally driving over a curb can all be readily felt and seen. But one of the biggest potential hazards to your car is on the road itself. What is this culprit, you ask? The dreaded POTHOLE! We’ve all seen them, sometimes in front of us, sometimes behind us. But most often, we notice potholes right before we grab the wheel tightly and shout a few less than lady-like words. Yup, potholes prompt potty-mouth language from the most dignified drivers. This is usually because we are unprepared for the coffee spilling, body bouncing jolt that we experience when we hit one. When we recover, we can immediately spot the stains on our clothing and the other disarray that the jerking has caused inside of our cars. Yet we don’t realize that these pesky road hazards can do significant damage to the outside of our cars as well. Whether you hit a small pothole or a cavernous crater that swallows your tire whole, STAY CALM! Not only will this help you properly assess the situation, but you’ll look better when you do it, despite the coffee stains. If you can avoid a pothole, do so, but do it safely. Don’t slam your brakes on, swerve into oncoming traffic or cross lanes without ample room. When you see potholes on the road in front of you, slow down gradually and steer around them if you can. If you can’t, slowing down will cause a weaker impact when you do hit the pothole. Once you’ve cleared the crater, find somewhere safe to pull over and inspect your car for damage. Start by checking for leaks.Streams of liquid pouring out of the bottom of your car is a bad sign. The oil pan and transmission pan are both at the bottom of the car. If they are leaking and you continue to drive, you can do some very severe and pricey damage. If liquid is shooting out of the bottom of your car, call your mechanic and get a tow right away. Check the tires too. If you see any bubbles, tears, cracks or dents in the tires or rims, this could indicate potential trouble. If you don’t see any suspicious signs of damage, get back in the car and take off slowly. Drive with your windows down and listen for any strange noises coming from your car. Pay attention to how your car handles – Is it running smoothly, or does it feel like you’re driving on gravel? Is it steering straight or pulling to one side and hissing like a snake? If you have damage to the tires, rims or the car itself, get to a mechanic you know and trust as soon as you can. Don’t continue to drive with damage because it could lead to bigger problems, costing you a lot more than another cup of coffee. Practice these strategies next time you come up on a pothole to keep you and your car looking and running great! 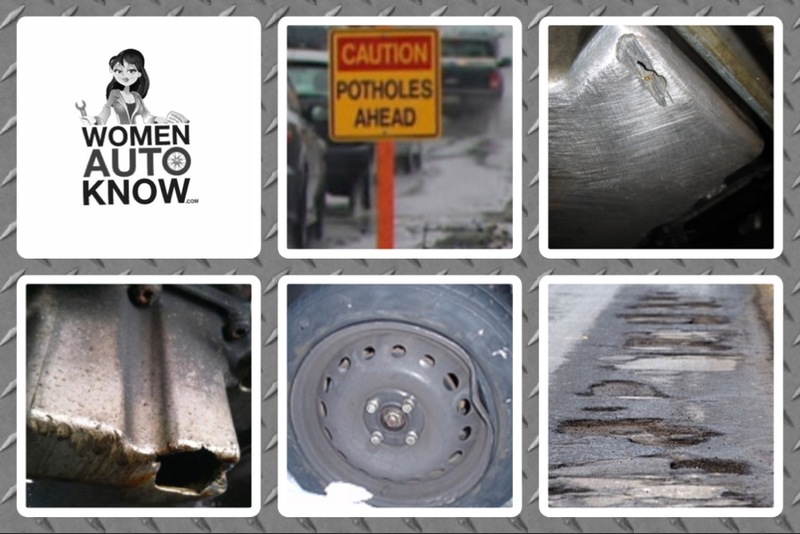 This entry was posted in Auto Safety and Prevention, Safe Driving Tips and tagged pothole, pothole damage by Women Auto Know. Bookmark the permalink.